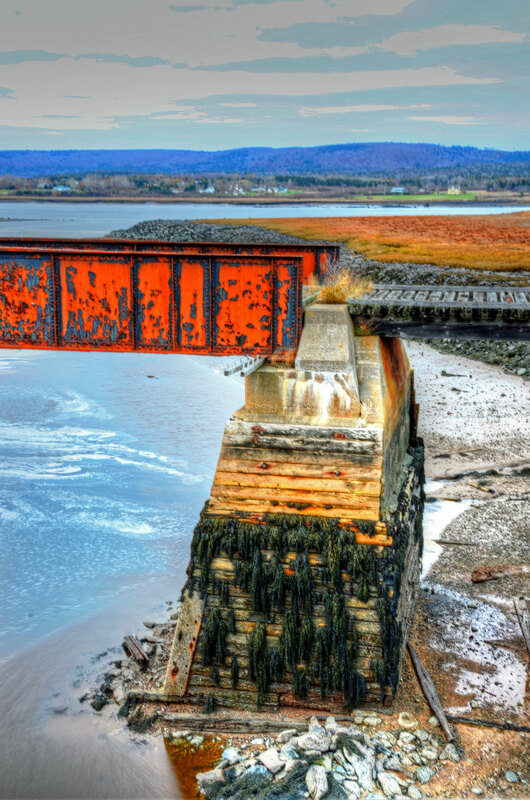 Beautiful Old Railroad Bridge, Near Clementsport, N.S. 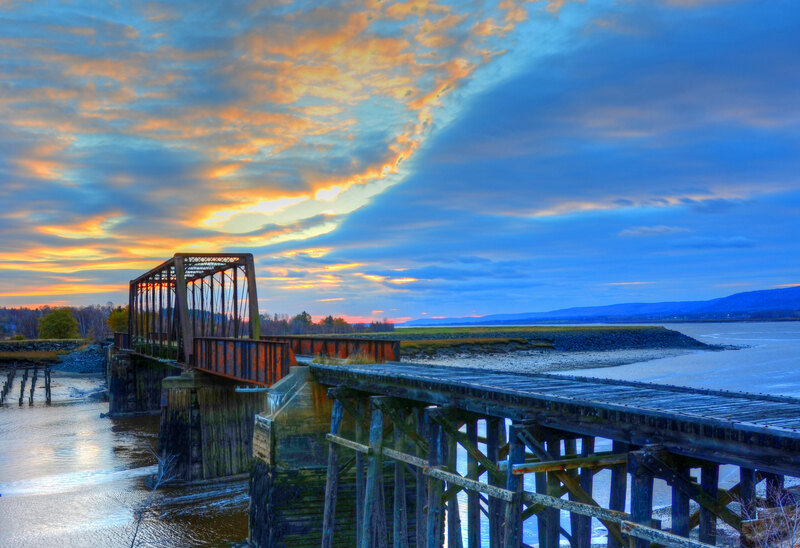 Near Sunset and Low Tide, Old Railway Bridge, Clementsport, N.S. 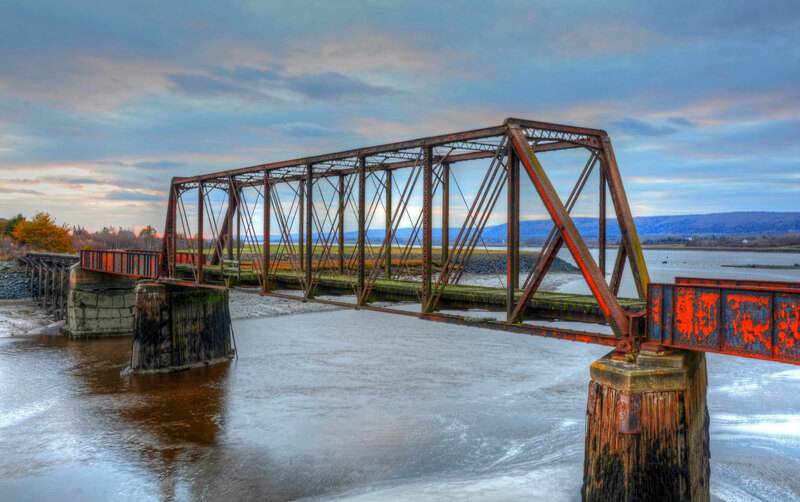 This rusted old iron railway bridge near Clementsport / Upper Clements in the Annapolis Valley area of Nova Scotia held my fascination one late Fall afternoon as the sunset slowly crept in. The point at which the forlorn bridge and its ancient wood trestle crosses the tidal river bend is both scenic and serene. On this occasion, the deep chipping orange-brown rust and the weathered blue-greens of the bridge’s structure harmonized perfectly with the complementary tones in the cloudy sky, the cool water and the distant hills. What an amazing bridge! Great captures especially the sunset one. That first photo, the sunset, looks like a painting. What a shot! I love seeing Canada through your lens. Thanks! What gorgeous captures!!! A lovely bridge, Brett! Kind of like point and counterpoint in music. Lovely! The colours are amazing and you captured the serene feeling so well. Stunning detail. Thanks for the quick response on dragonshades! Thanks! Your work on dragonshades is fascinating! Like you I like to explore the way that we see. Thanks so much! Yes, it’s a beautiful country. Looks like you’re in a gorgeous place too — New Zealand. Sounds like quite an adventure! You capture colours (especially reds) so well. If you don’t mind my asking, what camera do you use? I found your site thanks to my “Craving Color” post (of a pomegranate). I appreciate your way here of staying with the subject—seeing it from different points of view. One shot I’m still curious to see—a frame-filling close up of the orange and blue peeling surface. I love close ups — such as your “Craving Color” image — and your suggestion is a great idea for a shot! I could not get close enough and didn’t have a good lens for that at the time, but that would be terrific. What a beautiful post. I did an internship about 14 years at the former CFB Cornwallis near Clementsport and am now trying to figure out if I remember a bridge. I apparently missed this! Louise, neat that you’re familiar with that area! You may have a better sense of the local geography and the bridge is on the way to Annapolis Royal, possibly closer to Upper Clements (that town and Clementsport seem to run together). Hmmm. I’m a bit sad now that I never noticed it. I remember Annapolis Royal though. Beautiful little town! You have some really nice pictures. Being from Canada, you probably get a good chuckle when you read about us in the lower US complaining about our winter weather don’t you? Thanks for the kind comments. Actually, I’m from here in the U.S. — just down the road from y’all in Atlanta — and after last week’s traffic chaos in Atlanta resulting from a mere couple of inches of snow, I imagine that even our normally polite Canadian friends can’t be blamed for a good laugh at our expense. Ah yes, now I see, so you are. I just read your About page! I saw the debacle in Atlanta on the news. People were upset the government didn’t do more to keep the roads clean. I guess they don’t realize it costs millions of dollars to keep that kind of equipment ready for winter weather and it probably occurs like that only once every 10 years or more. For anyone in the South I have a good driving tip. If the roads are icey, STAY HOME. The roads will be clear tomorrow! Lovely, lovely images-the color and light is wonderful! Thanks. It was a nice time of day to be taking pictures outdoors. Thanks so much! This bridge cried out to be photographed! This bridge is amazing and your photographs are stunning!!. My husband and I are just starting to build an O gage model train display and a bridge like this would be a nice addition to our display. Thanks for sharing your photos. Jade, thanks! An O gauge model train display sounds like great fun! Wonderful! Love all the color and that sky in the first photo is awesome! Thanks! That was a gorgeous sky that evening! Very good photos. I photograph old places/ buildings here in Ontario. My challenge this summer (set for myself) is to photograph one of the older concrete highway bridges before it’s demolished and replaced. Not so easy to find access where the police won’t be annoyed about having a car stopped by the bridge, either over it or under it. Your photos are just breathtaking !!! I know the bridge but the way you bring out the colors makes it magical 🙂 ! !